"We so sorry for your loss Papaw was a great man & so good to our granddaughters.Your all in our thoughts and Prayers." 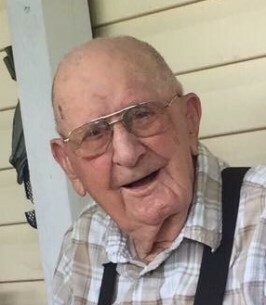 William F. “Bill” Burton, 95 years of Hillsboro, passed away Friday, September 21, 2018. He was born in Payton, Kentucky on May 20, 1923, the son of the late Ventus and Edna (Lykins) Burton. Besides his parents, he is also preceded in death by his wife, Rosetta (Rosie) Burton, one daughter, Sandra Burton, one grandson, William Dennis Riley, two sisters, Nell Nickell and Dorothy Jean Hoskins. Bill retired in 1978 from General Motors after 32 years of service. Bill served in the United States Air Force during World War II and was a lifetime member of AMVETS Post 61 Rocky Fork Lake. Bill is survived by his daughter, Pamela (David) Manning of Hillsboro, significant other, Pat Jarjapka, five grandchildren, Katie (Mark) Dettwiller of Hillsboro, David (Lori) Manning of Lynchburg, Bev (Stacy) Manning of Hillsboro, Kris (Charlie) Jarjapka of Hillsboro, Kathy (David) Puckett of Batavia, 12 great grandchildren, 5 great great grandchildren, nieces, nephews and a host of friends. Funeral Services will be 11:00 A.M., Wednesday September 26, 2018 at the Thompson Funeral Home in Hillsboro. Burial will follow at the Hillsboro Cemetery with Military Graveside Rites conducted by the Highland County Honor Guard. Friends may call from 6:00 PM to 8:00 PM, Tuesday September 25, 2018 at the Thompson Funeral Home. Family suggests memorials Heartland Hospice. To sign our online guestbook, please visit us at www.thompsonfuneralhomes.com . To send flowers to the family of William F. "Bill" Burton, please visit our Heartfelt Sympathies Store. We so sorry for your loss Papaw was a great man & so good to our granddaughters.Your all in our thoughts and Prayers.